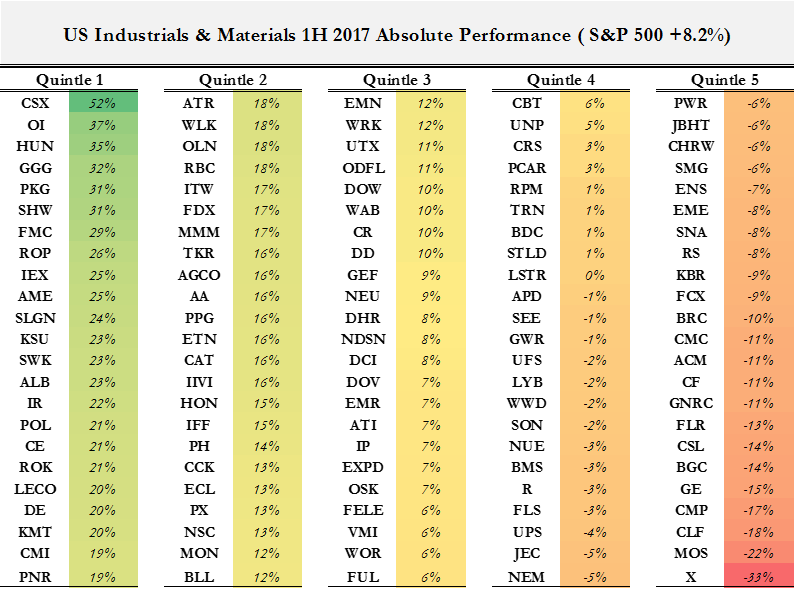 Midway through 2017 the best and worst performing stocks in the Industrials and Materials sectors have very different “activity” profiles. The top performing stocks demonstrate the impact that change can create – activism, M&A or a new CEO, fresh approach, either drives better results or drives expectations thereof. 15 of the top 25 performers in 1H ’17 have had a recent CEO change (in some cases at the behest of an activist) or recently completed/pending M&A. 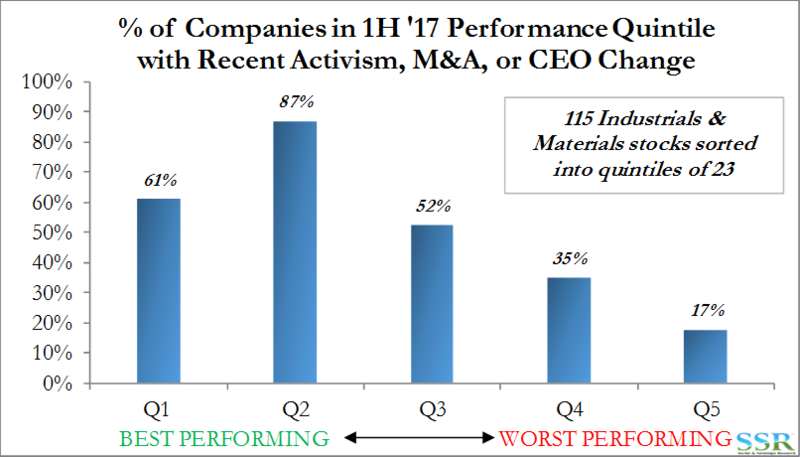 Of the bottom 25 performers only 4 have had any activity – GE and X, both with very recent CEO changes (under pressure) and CSL and ENS with planned CEO changes. X is up since the change in CEO. GE remains a solid underperformer. It is not only activist shareholders that are driving change – years of slow growth and disappointing expectations are driving changes in strategy for the more progressive companies and for those being nudged by traditional shareholders. It is not just the top 25 performers that show this change – there is a stark difference between the top 50 and the rest. 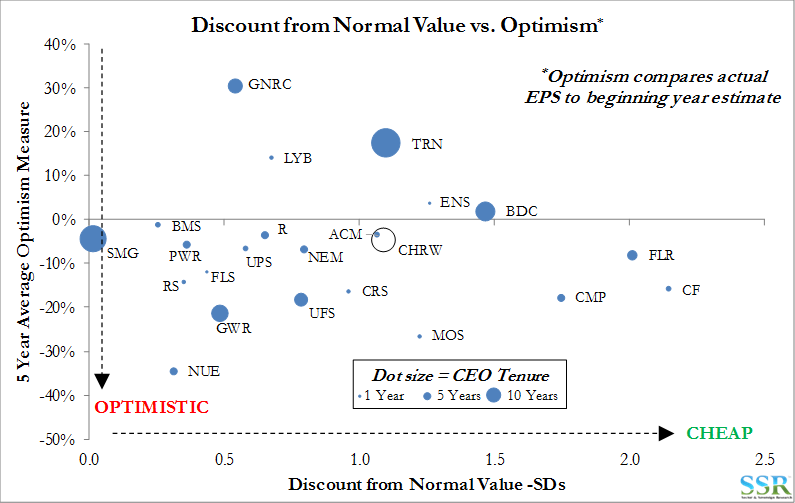 GNRC and TRN also look interesting because the longer tenured management is not being given the benefit of the doubt. The better performing companies in the first half of 2017 had a better story than those that underperformed, but that story was just as influenced by change as it was by performance. 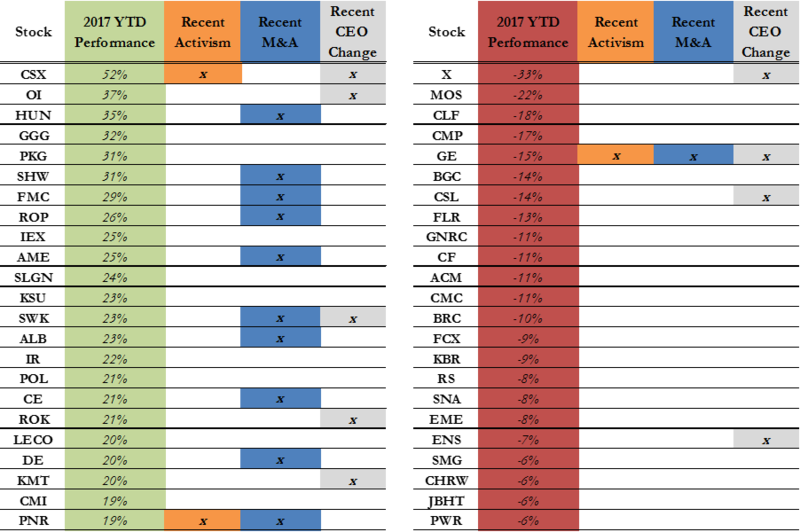 As shown in Exhibit 2, the top two quintiles in our coverage universe showed much more dramatic change in terms of activism, M&A and management change than the lower quintiles. 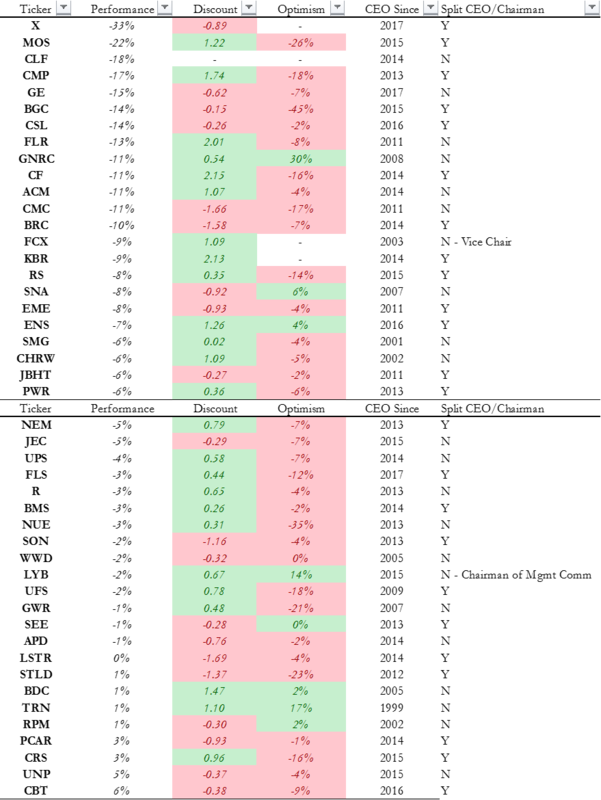 In Exhibit 3 we break down the type of change for each quintile – the individual columns do not add to the totals as in many cases we are seeing more than one change. In Exhibit 4 we show first half performance by quintile group – 115 Industrials & Materials stocks sorted into groups of 23. So how is this investible? Exhibit 5 is complicated but we think it gets to the more interesting short list. The X axis is value – the further to the right the cheaper the stock. The Y axis is optimism – the closer to the bottom the worse track record a company has of predicting its own future. The size of the circle measures CEO tenure – i.e. how long he or she has been predicting earnings incorrectly and possibly deploying capital inefficiently as a consequence. The following companies stand out as needing a bit of a shake-up: FLR, CHRW, UFS, GWR and possibly SMG. These are names we would own in anticipation of change and a move to higher quartiles as a result. Exhibit 6 shows the data by company.